Charles Wysocki gives this rendition of Sea Captain's Wife, Praying: "I have been painting this love story for about 10 years or so and I find it to be one of my greatest joys. I guess I am one of those hopeless romantics." "So the saga continues through my paintings, set in New England in the Victorian era on the theme of the faithful wife patiently waiting, perhaps years, for her sea captain to come home to her once again. This lure of the sea and the command of his own ship was his lifelong desire and pursuit. His wife knew of this commitment and has graciously accepted the long absences, accompanied by pleasant memories but dutifully enduring the long lonely vigils, with the unbearable thought that she may never see him again. She is ever aware of the many dangers he faces at sea, especially as winter approaches and keeps him constantly on her mind, in her heart and in her prayers." 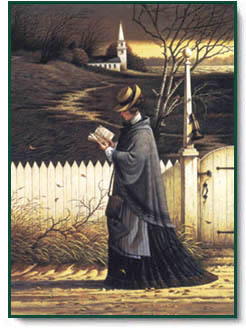 Sea Captain's Wife, Praying copyright © 1999 by Charles Wysocki.